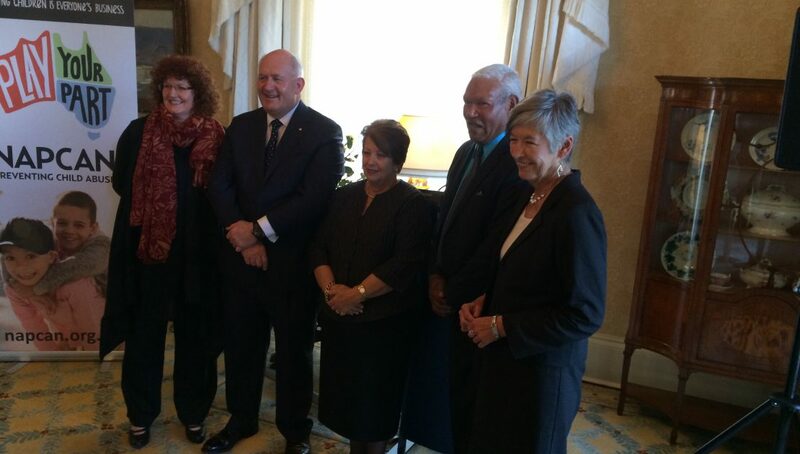 The 2014 National Child Protection Week campaign was launched at an afternoon tea hosted by Their Excellencies, Sir Peter Cosgrove and Lady Cosgrove. The week officially commences on Sunday 7th September and runs until Saturday 13th September. NAPCAN acknowledges the Governor General’s leadership in supporting this campaign. “It is our absolute responsibility to nurture and care for our children. We must protect and encourage them, and we must do all we can to ensure their happiness and wellbeing as they grow and learn. This is why I passionately support the work of NAPCAN and today I am pleased to join with them in raising awareness of National Child Protection Week,” said Sir Peter Cosgrove. At the event the Governor General presented two of the national NAPCAN Play Your Part Awards to White Ribbon Australia for their Breaking the Silence Schools program and Wollongong City Council for their Child Friendly Cities Initiative. The rest of the Play Your Part Awards will be presented at events organised nationally in each State and Territory over the next week. National Child Protection Week aims to educate Australians about the many ways in which they can share ideas to create positive change, whether it is through participating in an organised initiative, hosting an event in the local community, or simply being someone who listens to children. Read about the 2014 Play Your Part Award recipients or look up a National Child Protection Week event in your community.